All too often we read or hear about an injury caused by a piece of farm equipment. There are more than 700 deaths and 100,000 injuries each year involving ATVs, according to Consumer Product Safety Commission’s (CPSC)* most recent data. The 3E model (Enforcement – Education – Engineering) used by occupational injury specialists is a method used to help reduce injuries and fatalities. Dr. Dee Jepsen is the State Agricultural Safety Leader at The Ohio State University and explains the 3E Model in relation to ATV safety. Read Dr. Jepsen’s article below to learn about how this model can be used effectively on the farm. Dr. Jepsen’s article was originally published in the Ohio Country Journal and is shared with permission. All-terrain vehicles (ATVs) continue to grow in popularity for rural and agricultural use. 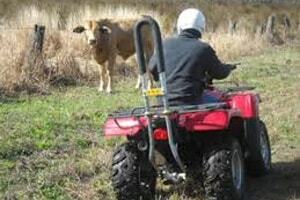 Originally designed for sports and recreation, the ATV is now common on many farms and ranches in the U.S. With this increased use comes increases in injuries and fatalities. And the costs for emergency room visits associated with ATVs grow each year. The 3E Model is used by occupational injury specialists to help reduce injuries and fatalities. Simply stated, the 3Es of the model are: Engineering, Education, and Enforcement. The use of a combination of these components can be effective in reducing injuries. In agriculture, there is little enforcement when it comes to ATV usage. The most common U.S. violation is the use of ATVs, and their Utility Vehicle (UTV) counterparts, on paved roads. By design, ATV’s and UTV’s are designed for off-road use, which is much different from cars, trucks, and motorcycles. Their low-pressure tires are designed to grab dirt, grass, sand, and rocks. Smooth pavement offers little traction and limited control. 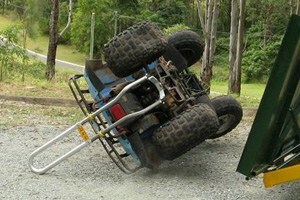 Tipping and rollovers are the most common ATV roadway cause for injury. Restricting ATV use on paved roads would be a plausible solution for safety. Allowing ATV’s and UTV’s to operate along the grass or gravel berm is a viable solution, as is operating them on dirt or gravel roads. For years, the ATV industry has relied upon education as a means of injury reduction. However, education and behavior-related safety trainings have failed to make a dent in the number of injuries associated with ATV operation ear year. Statistics show many fatalities and injuries occur in the first-year of ownership, indicating training may not be given to new riders. Annual training is recommended for all riders. The area that has received little attention for ATV safety is engineering. To put it simply, the vehicle’s design is still susceptible for tipping and rollovers, which are the most common cause for fatal and non-fatal injuries. A new device is available for after-market installation to prevent crushing of the ATV operator in the event of a vehicle rollover. Different from the RollOver Protection Structures (ROPS) on tractors, the Crush Protection Device (CPDs) acts as an anti-roll bar stopping a continuous roll in a side overturn, and usually diverts the vehicle away from the operator in a rear rollover. CPDs do not require seatbelts, which allow the riders to eject the machine, and prevent being pinned. 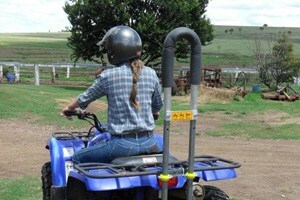 The Quadbar is an Australian-made CPD, designed specifically for agricultural use ATVs. The low-profile, hairpin hoop mounts to the drawbar and rear rack area of the machine, and does not impede with suspension or functionality. According to the product manufacturer, tests have been performed to show the Quadbar is an effective device to protect the operator in a side roll. On a 20 degree or 36% slope, vehicles without the CPD rolled two full rolls. With the Quadbar in place, the vehicle still rolled, but the device kept the ATV to a quarter roll. When speed was applied to increase the momentum of the roll, tests showed the Quadbar was an effective device to protect the driver from being pinned under the vehicle at half, three-quarter and full rolls. In a typical rollover crash, the vehicle lands on the operator, pinning the person under the machine. By design, Crush Protection Devices keeps a space between the vehicle and the ground. During the same tests on a 20-degree or 36% slope, the Quadbar takes the brunt of the force on a rearward roll backflip. In these crashes, the ATV will rise up on the crush bar, then fall to the side. Riders are not pinned under the weight of the machine. Serious injuries of ATV crashes are often caused by the vehicle rolling on the operator. Serious injuries of ATV crashes are often caused by the vehicle rolling on the operator. Death can also occur from asphyxiation when the ATV lands on the rider, pinning him or her for minutes to hours under the 500-pound (or more) vehicle weight. Drowning can also occur if the ATV lands on the victim, even in shallow water. While ATV injuries continue to be in Consumer Product Safety Commission reports, deaths can be prevented with the use of aftermarket Crush Protection Devices. These after-market engineered bars are saving lives in side and rear rollover situations. Additional information about the product described in this article can be found at the North America based website Quadbarsafety.com. The product designer, David Robertson from Queensland Australia, was recently acknowledged by the International Society of Agricultural Safety and Health (ISASH) organization for his Quadbar design and injury prevention efforts. Beyond this engineering control, Australia is considering legislation for mandating installation of CPDs on ATVs used on the farm and other occupational worksites. Robertson’s comprehensive efforts to reduce agricultural ATV injuries in Australia are now becoming known in other parts of the world. While this article does not provide product endorsement, there is considerable value for installing Crush Protection Devices on All-Terrain Vehicles. This engineered product is designed to prevent serious injury and protect lives while performing agricultural tasks. CPDs, along with rider training courses, and helmet usage have potential to curb the rising injury statistics for ATVs in the United States, similar to what is being done for Australian farmers. Dee Jepsen, Associate Professor, can be reached at 292-6008 or jepsen.4@osu.edu. This column is provided by the OSU Department of Food, Agricultural and Biological Engineering, OSU Extension, Ohio Agricultural Research & Development Center, and the College of Food, Agricultural and Environmental Sciences. Fact sheet on ATV injuries and Crush Protection Devices (CPDs). 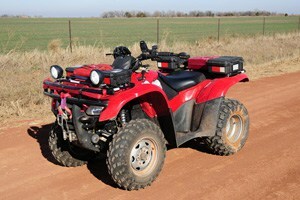 Review the UMASH Farm safety checklist on ATV safety.